- Author of “The Complete Guide to Ringette Goaltending” and "The Complete Guide to Ringette Goaltending's Ringette Goalie Warm Ups, Conditioning and Off Ice Skills"
Contact us if you'd like to hire Alissa to run a Nutrition Session for your team and for more information, click here. with the University of Alberta. - Has been teaching Ringette goalies for 6 years. Started teaching with Edmonton Ringette and has taught various clinics and summer camps with the U of A, ATC Goaltending and 5-Count. - Is working on finishing her last few courses this year at the U of A, getting her BA in Sociology. at the Ballpark as a Customer Experience Rep.
Kailey is very excited to be coaching with the 5-Count team at this year's summer camp in Edmonton, after coaching with them for the past season. Jessi is going into her 15th year of ringette. Jessi has been a goalie for 12 of her 15th years. She has played for the University of Alberta for one year and is hoping to make the team again for this upcoming season. The U of A team won the University Challenge Cup last season to become the top university team in the country! Jessi has been a goalie for 12 of her 15 years, and has played9 years at the AA level. Jessi has been picked up for Team Alberta to compete at the Canadian Ringette Championships three times and has won a medal all three of those years. Ashley has played ringette for 12 years (Zone 5 and Edmonton Belle AA) and is also moving from Belle AA into Open this season. She is also a multi-sport athlete, recently becoming the 2011 provincial champion for lacrosse. Ashley is majoring in Sociology, specializing in criminology and wants to be a police officer so she'll be ready to practice keeping those goalies in line. - Has played ringette for 10 years - 7 years in Sherwood Park, 2 for U of A, and the previous year with Edmonton Relit. - Has coached ringette for 3 years - 3 years with Sherwood Park, 2 with U of A Ringette summer camps, and 1 with Gold in the Net in St. Albert. - Is finishing her last year of her BSc in Psychology. She hopes to then get her Master’s in Speech Pathology. Starting her ringette career in Red Deer, Brea is now heading into her 17th season. A late entry into the AA program, Brea started playing AA for Calgary in her third year belle. 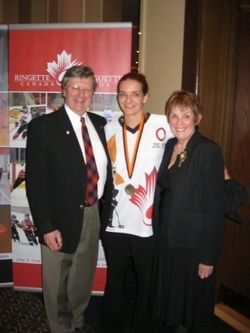 Bobbi has played ringette in Calgary her whole life. She has played ringette for 16 years now and has been a goalie for all 16 of those years. She entered into the Calgary AA program at a young age and has never looked back. She is currently playing in her 6th year as a Rath goaltender and is looking forward to a competitive Western league in the National Ringette League. Photo and info coming soon! Ashley has enjoyed a few seasons now under her belt with the Richmond Hill Lightning in the NRL. Off to a great start this year, Ashley is excited to be joining 5-Count as we expand into the Ontario market. Ashley Vlarr has played Ringette for 15 years at the A and AA level in Southern Ontario, including for the Richmond Hill Lightning in the NRL. She has been a goalie instructor for both the National Ringette School and the Richmond Hill Ringette Association for 3 years, and is looking forward to joining 5-Count to teach more Ringette goalies in Ontario. Ashley attended Niagara College for a diploma in Recreation and Leisure and currently works in a greenhouse in the flower industry. 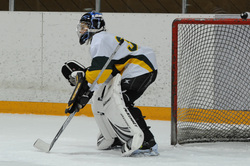 Jasmine is one of the young up and coming goalies in the Ringette community. 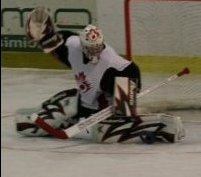 Fresh off backstopping Team Canada East to a U19 World Championship Gold Medal in December 2012, she was also recently named as a goalie to the Senior National Team and is training to compete in the World Championships this coming December, 2013 in North Bay. Jasmine is very excited to be joining 5-Count to help support our Ottawa and New Brunswick regions, teaching younger goalies all the finer details she has learned over her career. Hailey Moore grew up playing ringette in West Ottawa and then Nepean, and has been playing for 17 years. She is currently in her second year of playing in the NRL for the Waterloo Wildfire. Hailey also has many years of experience coaching goalies and instructing at camps. with the goalies in Saskatchewan! seasons. She has been playing for Lower Mainland Ringette League's AA program for 8 years, going into her second year of U19 this season. Tara competed in her hometown during the 2012 Canadian Ringette Championships, playing for Team BC, and represented BC again in the 2013 CRCs. 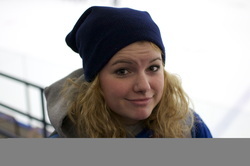 Tara hopes to have a long career playing and instructing ringette. Sam is looking forward to help instruct with 5-Count this season.